--Rumi, 13th-century Persian poet, jurist, theologian, and mystic. Tuesday, May 14 at 5:00 pm, Chilmark. Free tours at the Grey Barn and Farm are every Tuesday at 5. Learn about organic dairying, cheesemaking and renewable energy. Directions at website. Thursday, May 16, 6:00 to 7:00 pm, at the Oak Bluffs Library. Join Saskia Vanderhoop for a unique approach to mentoring based on indigenous ways of learning. For more info, call 508 693-9433. Sunday, May 19, 10:00 to noon, Chilmark. Mushroom Walk with mycologist Wesley Price at Menemsha Hills Reservation in Chilmark. Members $5, non-members $10, children (under 15) $3. Pre-register by calling 508 693-7662. Thursday, May 23, 10:00 am to noon, the Polly Hill Arboretum. Spend a morning with volunteer coordinator Nancy Weaver, executive director Tim Boland, and other PHA staff for an introduction to the many ways you can become involved at the Arboretum. Participants will tour the plant collections, review Arboretum history, and learn what goes on behind the scenes. Free and open to all. Call Nancy to register at 508 693-9426. Saturday, May 25, 9:00 to 10:00 am, State Beach, OB/Edg. Please join VCS for a Composting Conversation next Monday at 12:30 at the Hebrew Center. To explore the future of composting on the Island, this meeting will bring together a broad range of stakeholders: representatives from our large-scale producers and consumers of compostable waste, officials from the Mass Department of Environmental Protection and local refuse district, industry reps, and many others. Sumner Martinson, Director of Mass DEP’s composting program, to discuss the new 2014 food disposal regulations, grants and available loans. Michael Bryan-Brown, President, Green Mountain Technologies, Inc., to present his company’s large-scale composting equipment. Don Hatch, Director of the MV Refuse District, for a “reality check” about what can work here. Scott Carroll, representative of Bruno’s Rolloff Inc., on issues related to hauling. Jim Athearn, Morning Glory Farm, on the perspective of the potential end-user of composted material. The M.V. Senior Center hosted a record high turnout Thursday night for a meeting of the All-Island Selectmen’s Association. Leading off the agenda was a striking presentation by VCS board member Phil Henderson on local impacts of rising sea levels. Phil discussed a variety of issues relating to climate change and sea level rise, but the most attention grabbing element was a series of maps specifically outlining what areas of our island will be completely submerged in the future. So attention grabbing, in fact, that the Gazette’s coverage of the meeting includes reproductions of the maps on their website. Depicting areas inundated at both 1 meter (yellow) and 2 meters (red) of sea level rise, the maps paint a stark picture of valuable land and critical infrastructure lost outright in the not-too-distant future. What the maps do not reveal is the much broader area subject to flooding due to storm surges and the ongoing effects of coastal erosion. Phil will be giving an encore performance of the Rising Seas presentation at the M.V. Commission’s meeting this Thursday, May 16 at 7:00 PM at the Stone Building in Oak Bluffs. The meeting is open to the public. Special thanks to Chris Seidel at the MVC for creating the map projections. 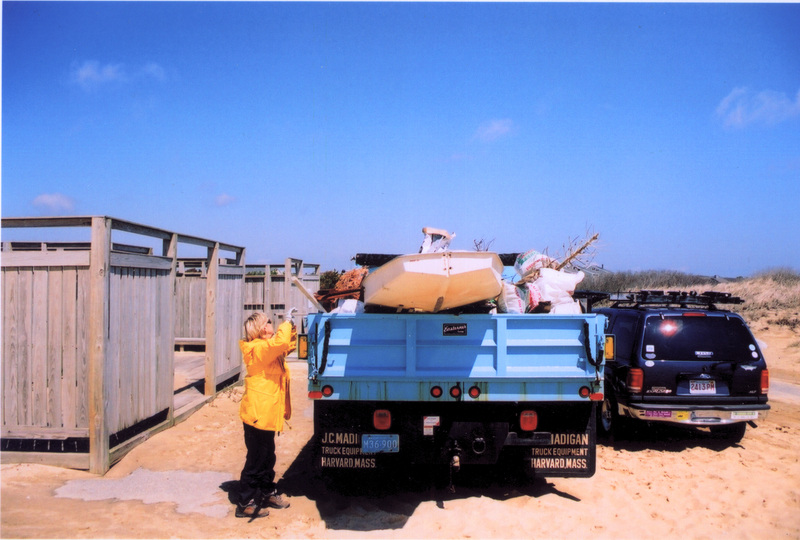 Compared to the Earth Day Beach Clean-up, hauling the trash should be a small task for the Edgartown DPW. The last of this season's Winter Walks, a short guided tour of the Mary Black Sanctuary in Edgartown followed by a volunteer clean-up opportunity, has been rescheduled for May 19 at 1:00. Park at the Edgartown School and look for VCS signs and flags. For more information, call our office at 508 693-9588. The 2.85-acre wooded parcel, located adjacent to the town cemetery, was owned by horticulturist Mary Black and her son Noel Evert Macy and maintained as an arboretum for many years. Today VCS holds a Conservation Restriction and the Town of Edgartown (our partner for the clean-up) owns the land. The parcel harbors an interesting historical resource in the form of the raised rail bed of the old Katama Railroad. It also includes a variety of debris from its arboretum days that will be the focus of the community clean-up. Bring gloves, sturdy boots and a shovel if you have one. “Historic land usage crossroads” is the theme of this year's walks, featuring properties where crises were averted with the help of VCS. The unique challenges in getting this small sanctuary into the “saved” column will be discussed. This piece was contributed by Jessie Holtham, MV Shell Recovery Partnership Coordinator. The Martha's Vineyard Shell Recovery Partnership, now in its 3rd year, has been working to recycle shells from restaurants, effectively decreasing inputs to the Island waste-stream and re-introducing the shell to salt ponds in oyster restoration efforts. 1) 1 recycled shell creates habitat for 10 new oysters! Your recovered shell is returned to local waters with baby oyster larvae attached from our local Shellfish Hatchery, helping to replenish wild oyster reefs and restore bottom habitat for many bottom species. 2) Save money by reducing heavy bulk shell waste from our dumpsters. 3) Combat Ocean Acidification* by providing calcium carbonate (what shells are made of), a natural water acid buffer. You provide the shell; we put it back in the water, completing a natural cycle. * the lowering of ocean pH due to increased CO2 dissolved in the water, global climate change’s chief partner-in-crime.